I'm anxiously anticipating my Montale samples. Was tempted to go ahead and request the other Montales I wanted to try, since different places carry different Montales (there are a whole bunch of them). But that would be a bit silly. Who knows, by the time I get this batch, there might be a new Montale out. So, what's the rush? I began this perfume quest a bit over a year ago, starting with some Annick Goutal samples (Eau d'Hadrien, Mandragore and Ce Soir Ou Jamais) and some Etro (Lemon Sorbet, Sandalo, Messe de Minuit, Royal Pavillon, Shaal Nur, Heliotrope, Vicolo Fiori, Gomma). In some ways I feel further away from having a signature scent, than I did a year ago. Not really though. I don't feel it has to be a linear path; my life has seldom been linear anyway. I've learned to start at one point and just keep on going. I've drained some of my samples...Annick Goutal Eau d'Hadrien, Ce Soir Ou Jamais, Heure Exquise (there's one more go of Passion left). 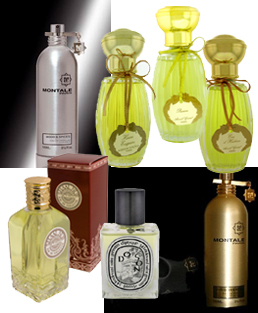 Also Diptyque Do Son, Montale Jasmin Full. I anticipate using up more...Montale Aoud Roses Petals and Crystal Flowers, the other Diptyques (except Philosykos, which smelled terrible on me, and possibly Ofrésia, which smelled bitter at first sniff), the other Annick Goutals, maybe...I didn't like Songes (too simple and sweet, though admirably strong and long-lasting), Gardénia Passion (also too simple and sweet). As far as Etro...most of the scents were love or hate. I anticipate using up Heliotrope (I have a full bottle of this as well), Shaal Nur, Vicolo Fiori, Royal Pavillon...that might be it. As far as Creed, eh...I like Montale better. The two Creed scents I tried, Fleurissimo and Jasmin Imperatrice Eugenie, were both singular, more traditional perfumes, but neither were "me." Fracas, you've got to like. It's not "me" either though. If the perfume fairy appeared right now and granted me however many perfumes I so desired...while we're dreaming, these perfumes keep perfectly and never turn...I could easily go for several of the ones I've tried. That's the appeal of "splits" and decants, the idea of being able to own relatively many fragrances, without otherwise living in penury, or, far worse, having your perfumes go bad. I'm not there yet though; still attached to the idea of two or three bottles.